For many years the C.F. Martin "D" or dreadnought shape guitar has dominated the market for acoustic steel string guitars. There are many good reasons for this. The large body size gives unparalleled volume and the somewhat "bassy" sound makes this a perfect instrument for rhythm guitar playing. As a result this is the ideal bluegrass guitar. This guitar is also a wonderful instrument for accompanying vocalists since the rich low registers complement almost any singing voice. In building this guitar I have always tried to achieve an appropriate balance with clarity at every playing position on the neck. Generally I build this guitar with a somewhat "stiff" top, which helps bring out the treble register, and make the body just a bit deeper than other makers -- this helps keep the strong bass, and the combination of these design features helps to make a well balanced guitar. It is important to me that my guitars have a high level of definition -- that you can hear the notes in a chord as well as the chord itself. In many ways I most admire the best of the old Gibson jumbo guitars which had these characteristics. I feel that I have been successful in achieving this result. 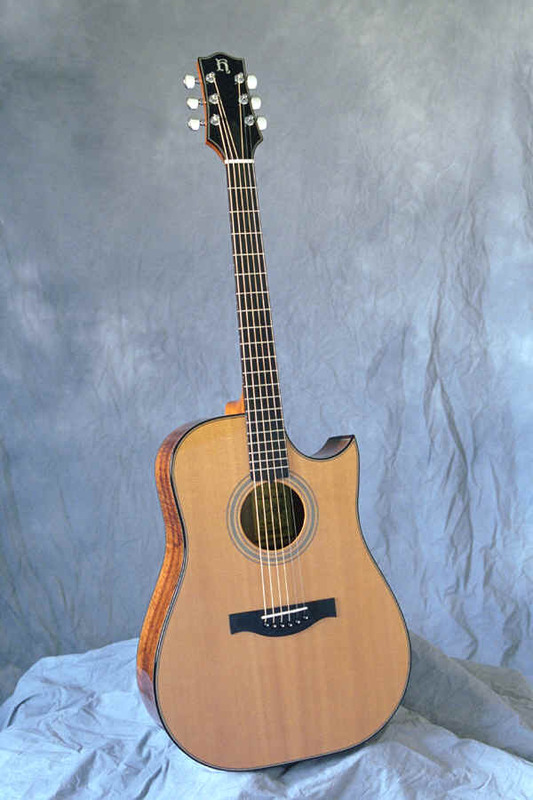 This guitar is available with a cutaway  a very popular option  and can be built with a 12 fret neck. 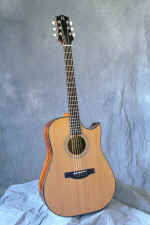 It is also available as a 12 string model. 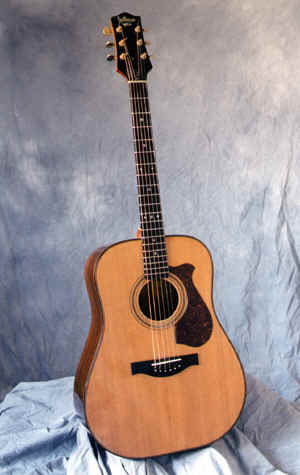 My very first guitar was a dreadnought and this is still the guitar which I play myself. The Dreadnaught is also available in a cutaway. The peg head shape shown in these photos, with a curved side, is standard on my larger guitars. Please note: This shape is based quite closely on the Martin D shape. I have begun building several guitars with the old Gibson Jumbo shape, which some call the slope shoulder D. This guitar will have the shorter 24.75" scale. More information can be found HERE.